NEW LOCATION as of 07/03/17! Visit the new location for the ARIZONA@WORK Pima County One-Stop Youth Employment Center. Services are offered to out-of-school youth/young adults (ages 16-24) and in-school (ages 14-21) who seek support in developing educational and career pathways. The Summer Youth Program gives students guidance on making a career plan, setting long term goals, building a strong support system, gaining work experience, developing a skill set, staying active during the next summer, planning for college tuition, increasing self-confidence, making better choices and more. Las Artes offers a unique learning environment for youth ages 17-21. Structured classroom study combined with community art projects allow students to prepare for general education development (GED) testing and build employability skills by participating in community art projects. Pima Vocational High School is a School-to-Work Charter School with a focus on youth ages 16 to 21 years old who are looking for an alternative opportunity to succeed in obtaining a secondary education along with vocational training. Pledge-A-Job program matches youth ages 16 to 21 with job openings pledged by local employers who are interested in hiring youth for summer, year round, full time and part time jobs. The Pima County Workforce Investment Board (WIB) Youth Council hosts Youth Career Expos each calendar year. Click on the link below for information and to sign up for the February 13, 2019 Expo! May 4, 2016 - "Career Pathways and Employment Fair" Youth Career Expo. May 6, 2015 - "Emerging Technologies" Youth Career Expo. 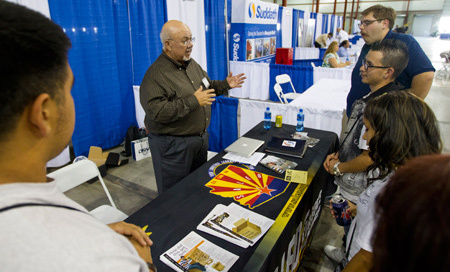 April 30, 2014 - "Logistics" Youth Career Expo held at the Port of Tucson, 6964 East Century Park Drive. It was a successful Expo for the 80 youth who attended and represented several area schools. Representatives from the logistics industry were available to provide information and answer questions.